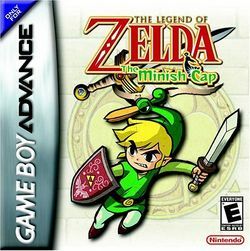 The Legend of Zelda: The Minish Cap is a game in the popular The Legend of Zelda series, released in 2004 for the Game Boy Advance. Like The Legend of Zelda: Oracle of Ages, The Legend of Zelda: Oracle of Seasons and The Legend of Zelda: Four Swords, it is produced by Capcom's company Flagship, rather than being made by Nintendo (although the series' creator, Shigeru Miyamoto, was still involved in its development). It was released for Nintendo 3DS Ambassadors in 2011. The game's storyline centers around the titular Minish Cap, a creature known as Ezlo. 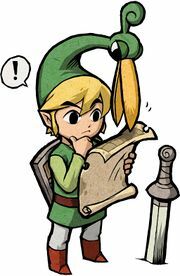 With his help, Link is able to shrink in size and visit the land of the tiny Picori. Many puzzles revolve around the new element of shrinking. It also features collectible Figurines (somewhat like those of The Legend of Zelda: The Wind Waker) as well as the entirely new Kinstones, fragmented stones, that merge to affect the world around you in "unexpected" ways. This page was last edited on 9 May 2018, at 12:21. This page has been accessed 37,849 times.